Billions of dollars are spent creating the movies you watch! The movie industry spends billions of dollars each year making movies that are as visually and audibly rich as humanly possible! The only way to enjoy these movies as the director intended is to either go to a movie theater or to watch them in your own home, with fine-tuned and high quality components. Yes, you can buy your own TV, get a pre-packaged surround sound system, and try to piece everything together yourself. Our very strong recommendation is DON'T! Don't waste your time! Don't waste your money! Don't waste your life! Generally, about anything is better than watching great movies through your plain old TV, so you are at least good there. But we estimate that about 90% of store-bought surround sound systems are a complete waste of money. Further, you also need a great receiver, the right flatscreen or projector, the right blu-ray player, an intelligent universal remote, and all of the knowledge to get the devices with the right specifications and ones that will work great together. Here we are to save the day! This is where we come in! Believe us when we say that we started this business not because we wanted to get rich, but we started it because we enjoy what we do and do it well! Let us put all of our years of experience and AV enthusiasm to work for you! We eat and breath this stuff! 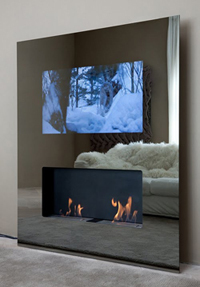 Imagine speakers that are flush with your wall or ceiling, wires and cables that are completely hidden, AV devices that are hidden in a cabinet or on the complete other side of your house or basement, and a remote that turns everything on, turns your lights down, closes your blinds, and sets the fireplace to just the right setting all at the touch of a single button. Now that is how these movies were intended to be experienced! You'll find that you'll enjoy movies even more at home than when you're at the movie theater! Our Niles Audio, Sunfire, and Definitive Technology Speakers and Sound Solutions along with Lutron RadioRA2 Lighting, Climate Control, and Window Treatments, a URC Universal Remote Control or full-blown ELan g! Automation and Control System will give us the tools to make your space and experience incredible! Your theater will be customized and tailored to you! Just give us a call for no-pressure advice and service! 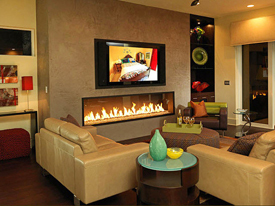 Let us customize a home theater or media room for you!